As soon as I read that kimchi may cure bird flu I knew what I was going to make with the last of the bok choy in the garden. Especially since once again I had left the plants in the soil until they were past their best. These bok choy were mainly stalk with most of the leaves eaten by the resident caterpillars ; a steaming pile of fresh Chinese greens was out of the picture for these plants. Whether or not the spicy fermented cabbage will guard me and mine from H5N1 is yet to be known, but I do know that this smelly spicy pickle feels like it does you good! You need to have a large preserving jar in which to ferment the kimchi, which needs to be sterilized and then sealed according to your chosen method. Here is an example. Wash the bok choy and immerse in the saline solution and leave over night. Drain and rinse the bok choy, leaving to soak in fresh water for about 15 minutes. 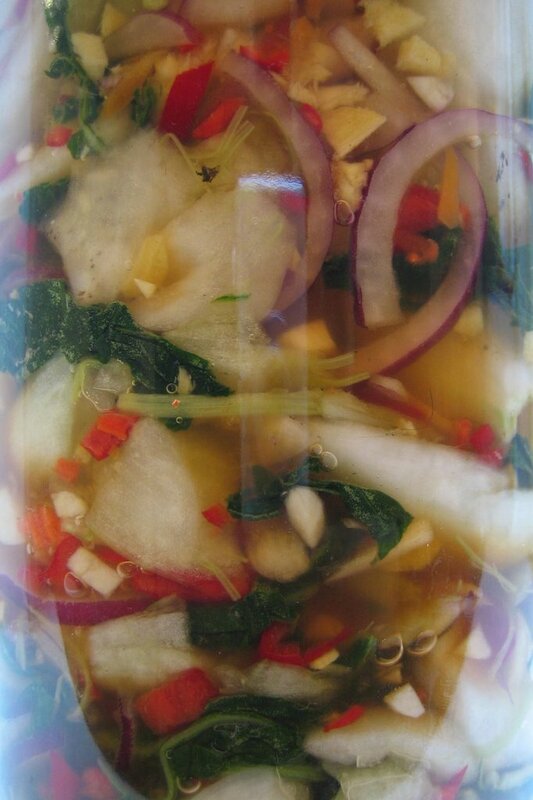 Drain the bok choy and mix with the garlic, ginger, chilli and onion and pack into a jar. Dissolve the sugar and salt in some warm water and mix in the soy and fish sauces, then pour into the (sterilized) jar. Top up with water and seal according to your preferred method. Leave at room temperature for at least 24 hours then refrigerate once opened. NB : Be careful where and how you store this vicious pickle. Mine fermented a tad to vigorously and broke the seal spilling stinky juice in the pantry. Consider yourself warned - this was not nice! You exactly described my bed of Pechay, (similar to Bok Choy in taste and appearance). Half eaten and stalky. I will try making kimchi with it. Thanks for posting the recipe! I have never hear of Pechay - I will have to keep a look out. Damn caterpillars! by the way, when mymom used to make kimchee, she always left the top UNsealed - just rested the lid on top, to account for the MASSIVE gurgliciousness of the fermanting process. she also ALWAYS placed the jar on a plate or shallow bowl to catch the "runoff." Sarah - that is invaluable advice, thanks!